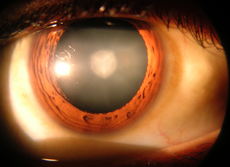 A cataract is a clouding that develops in the crystalline lens of the eye or in its envelope, varying in degree from slight to complete opacity and obstructing the passage of light. Early in the development of age-related cataract the power of the lens may be increased, causing near-sightedness (myopia), and the gradual yellowing and opacification of the lens may reduce the perception of blue colours. Cataracts typically progress slowly to cause vision loss and are potentially blinding if untreated. The condition usually affects both the eyes, but almost always one eye is affected earlier than the other. Signs and symptoms As a cataract becomes more opaque, clear vision is compromised. A loss of visual acuity is noted. Contrast sensitivity is also lost, so that contours, shadows and color vision are less vivid. Veiling glare can be a problem as light is scattered by the cataract into the eye. The affected eye will have an absent red reflex. A contrast sensitivity test should be performed and if a loss in contrast sensitivity is demonstrated an eye specialist consultation is recommended. In the developed world, particularly in high-risk groups such as diabetics, it may be advisable to seek medical opinion if a 'halo' is observed around street lights at night, especially if this phenomenon appears to be confined to one eye only. The symptoms of cataracts are very similar to the symptoms of ocular citrosis.